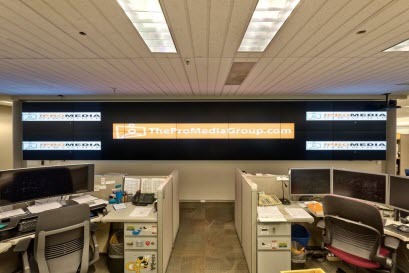 The ProMedia Group, is a leading provider of Audio Visual solutions in the greater Tampa Bay area, including Orlando, Sarasota, Lakewood Ranch Florida and Atlanta, Georgia. The group was recently featured in an Audio Visual case study by Panasonic regarding its recent installation of a 27 foot wide video wall. The panasonic video wall was made up of 14 Panasonic TH-55VF1HU displays that provided a massive amount of information for Tampa Electric Company of Tampa Florida. The Display will provide Tampa Electric Company with real time power deployment decision making capability. Mounting, wiring, and interfacing the 18 Panasonic display screens with the Creston Control system went, according to Ken Avis, “as smoothly as expected” except for one unforeseen glitch: the 30-foot wall intended to hold the long video display turned out to be warped. The ProMedia Group made sure the installation wall was perfectly flat by adding installation rails that allowed the panels to be mounted as tightly as possible. “Panasonic, as usual, came through. Which validates a point I try to make every time I introduce Panasonic products to potential customers. That with Panasonic, you’re not just buying the high performance of the units, you’re also buying an unparalleled level of service,” further notes Avis. The ProMedia Group is an Audio Visual solutions company and Audio Visual Consultant whose offices are based in Tampa Bay, Florida and Atlanta Georgia. The ProMedia Group is the leading single-source provider in video conferencing, audio visual and network solutions.